This badge was issued to Daniel Ross on 10 Oct 2018. 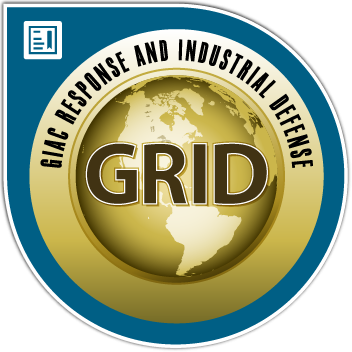 GRID certified professionals have demonstrated they are qualified to perform Active Defense strategies for Industrial Control System networks and systems. They have demonstrated understanding of the Active Defense approach, ICS-specific attacks and how they inform mitigation strategies. Candidates must also show an understanding of the strategies and fundamental techniques specific to core subjects with an ICS-focus such as network security monitoring, digital forensics and incident response.